What every rider should know! A premium oil designed for those who demand the absolute best lubrication for their motorcycles. It is the result of extensive research and is specially formulated to excel in all areas unique to motorcycles, including the high temperatures of air-cooled engines, wet-clutch lubrication, extreme-pressure regions of gears and chains and rust protection. 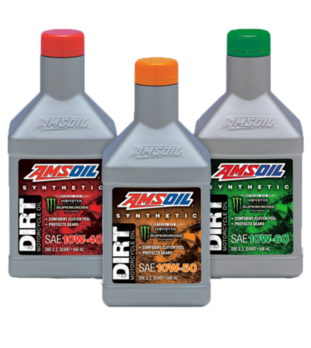 Shop the AMSOIL online store for our advanced synthetic motorcycle oils - specially formulated to provide superior performance and maximum protection in a wide variety of domestic and foreign motorcycle applications. "In my training endeavors, I run into a lot of end users who are high performance junkies just like me. I have no problem sharing my experience with the AMSOIL products. Thank you so much for the great product." "I'm still driving the car," Armstrong said. "It runs as sweet as it ever did. I'm definitely sold on AMSOIL." He was about 50 miles from home on the return trip when he stopped and checked the oil. "There was not a drop of oil on the dip stick," Armstrong said.